Hansen/Mowen's CORNERSTONES OF COST MANAGEMENT, 4E demonstrates the dynamic nature of cost accounting in today's changing business environment. The text first covers functional-based cost and control and then activity-based cost systems, giving you the understanding and skills to manage any cost management system. Using extensive research on how students like you prefer to learn accounting, this book presents concepts in a unique format that speaks to how students learn. 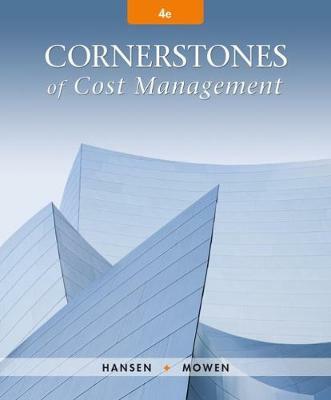 Cornerstones examples in each chapter emphasize the How, Why, and What-Ifs of basic cost management concepts, while delving into the conceptual nature of each equation or topic. An integrated CengageNOWv2 package reinforces concepts with additional computerized exercises and problems.